DK Eyewitness travel guides: award-winning guidebooksDiscover Switzerland with this essential travel guide, designed to help you create your own unique trip and to transport you to this beautiful country before youve even packed your case - marvel at the iconic Matterhorn, explore the fascinating art galleries and museums of Basel or stroll around the historic town of Lausanne on Lake Geneva. 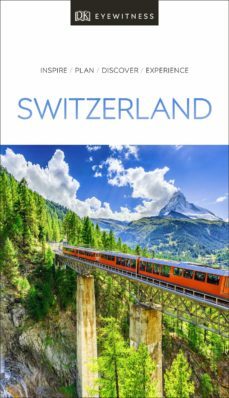 The DK Eyewitness Guide to Switzerland covers the must-see sights and the hidden backstreets, so you wont miss a thing. Gorgeous, all-new colour photography so you can imagine yourself there Reasons to love Switzerland: natural wonders, rural traditions and world-class skiing - what will yours be? See Switzerland from a different angle - 14 pages of fresh ideas for exploring this spectacular country A year-long calendar of events in Switzerland gives a selection of local events and festivals for all seasons Expert advice covers the practical stuff: get ready, get around and stay safe Over 10 detailed, colour maps help you navigate the country with ease Expert tips to make memories that last - where to snap and share the perfect photo, take in stunning views and escape the crowds The most authenticplaces to stay, eat, drink and shop Easy-to-follow walks and itineraries take you on a tour of each area, with plenty of eat and drink stops en route Hand-drawnillustrations show the inside of the must-see attractions, including the impressive Cathédrale Saint-Pierre, Berns masterpiece-filled Kunstmuseum and the enchanting Château de Chillon Covers Bern, Mittlelland; Bernese Oberland and Valais; Geneva; Western Switzerland; Northern Switzerland; Zürich; Eastern Switzerland and Graubünden; and Central Switzerland and TicinoDK Eyewitness Travel Guide Switzerland is a detailed, easy-to-use guide designed to help you create your own unique trip.About DK Eyewitness Travel: For 25 years, DKs beautifully practical Eyewitness guides have been combining inspiring ideas and expert advice with easy-to-read maps and vivid photography to inform and enrich your holiday. Now they have a stunning new look that you will love even more. DK is the worlds leading illustrated reference publisher, producing beautifully designed books for adults and children in over 120 countries.